It all started in 2004 with, “Wouldn’t this be a wonderful place to have a concert? !” Standing on the plaza in front of the incredible 1950s building with the giant dome (which houses the Seyfert Telescope) and looking out at the surrounding oak and hickory forest, one can easily get a sense of how special this place would be for listening to talented musicians. 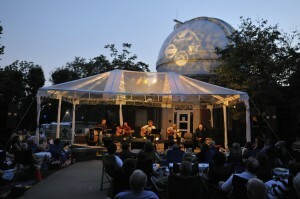 On one of the tallest hilltops in Nashville, the concerts are scheduled around glorious sunsets on the portico of the Vanderbilt Dyer Observatory. 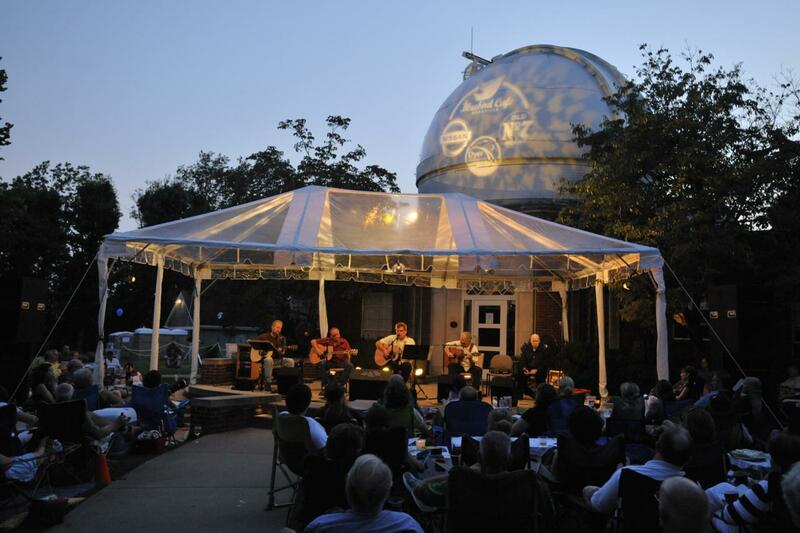 Guests are encouraged to bring blankets, lawn chairs, food, and drink and relax on the Observatory’s front lawn to enjoy a fabulous evening of sunset, music, and stars. After the performance, when the stars begin to shine, the telescope is opened for visitors to cap their night with views of celestial wonders. Individual concert tickets are available on the first day of the month prior to the show date at noon (i.e. the Oct 6 concert tickets become available Sept 1 at noon.) Concerts take place May through early October. Please note that tickets sell out quickly. A ticket is for a carload with up to 8 guests. You may reach our ticketing page here. PLEASE NOTE: Because we are in a natural area surrounded by Radnor Lake State Park, we urge you to use insect and tick repellent when attending events. Thanks to Amy Kurland and Erika Wollam-Nichols of Bluebird Cafe fame, we are producing a series of in-the-round style events that have been absolutely wonderful. The performers have included the top songwriters in Nashville. In 2018, we celebrate our 15th cooperative Bluebird concert season in May and continue monthly through October. We encourage carloads of people to attend by purchasing a “carload ticket.” Bring up to eight people in your car. No RVs please. A big, giant THANK YOU to every one of them!